The time has come. You’ve either decided to propose your girlfriend for a life together or thinking about it. What do you do now? 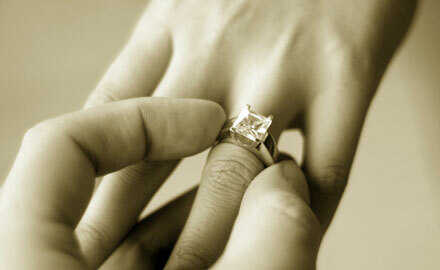 First thing to do is to buy a diamond engagement ring, a ring that shows your love for her. Since people are inclined towards engagement rings, we highlight the engagement ring purchase options to help you through. A friend of mine on facebook just posted this and I am impressed with Michael’s ability to lay out a creative proposal by using his superb video editing skills & making the ideas in his mind come together. Here’s a quick outline of what you will see in the video, the most creative marriage proposal of 2011. 15 – 1:40 – Where Michael plays with the poster radio that seems to respond to his every wish. Need ideas for creative marriage proposals? 5:25 the recording shows him on the back deck waiting for Jen to respond to the video. 6:42 Michael gets up and they embrace in a beautiful moment…. 7 minutes – Where Michael picks up his bride to be and her pink slippers fly into the air!! Love this part!!! So they are now engaged as of January 19th, 2011. Love the phrase Gingers Unite at the end. What do you think of this?